New Year’s Eve is a great time to go with a sparkly nail polish. 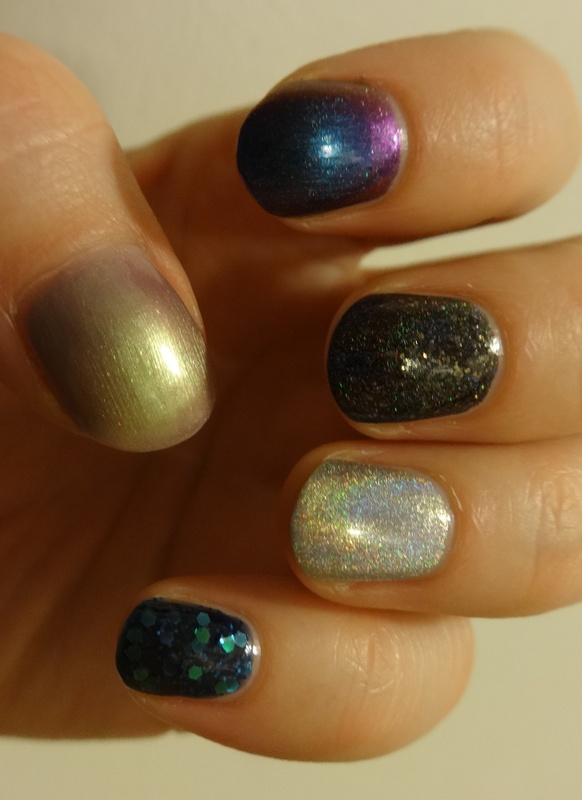 For my New Year’s Eve party choices, I went with polishes that all have some kind of extra “wow” effect. 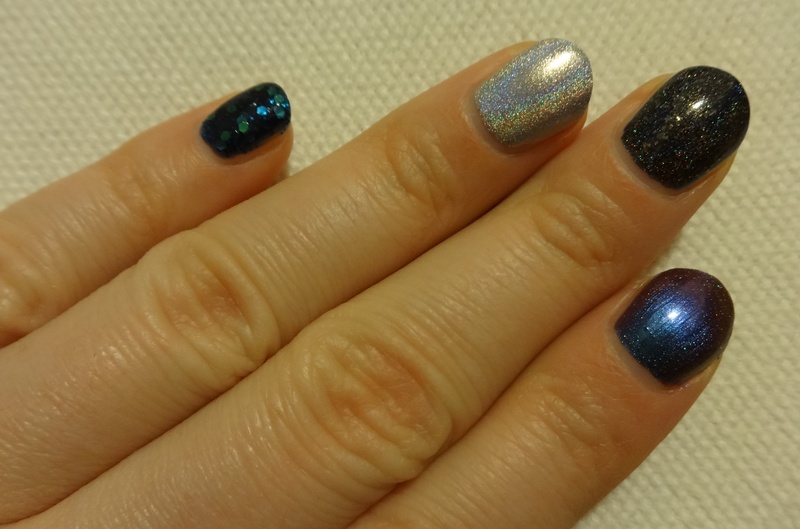 Pointer: I Love Nail Polish “Birefringence (H)- An insane multichrome that shifts Blue-Purple-Pink-Orange with holographic sparkle added in. No matter what you wear to the NYE party, this will definitely go. 2 coats, but you could go with one. 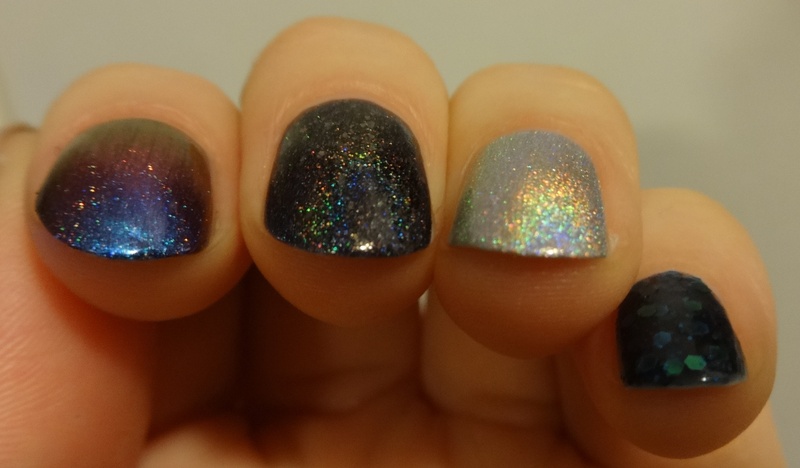 Middle: Colors by Llarowe “All Bidness”- A black holo with gold flakes. I love this color and will continue to recommend it to all people at all times. Two coats. Ring: Color Club “Harp on It”- A nice light silver holo. 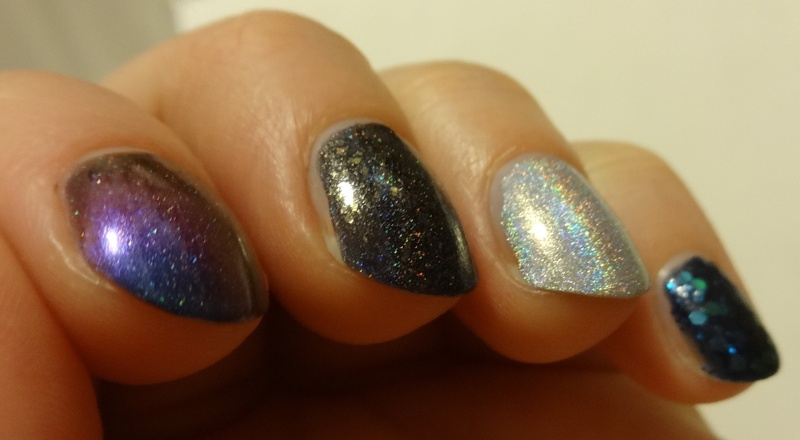 (What I’m really saying here is that if there’s any appropriate time for holo, it is New Year’s Eve. Do it.) This is a nice choice if you want to go with something light. Two coats. Pinky: Sally Hanson “Mermaid’s Tale”- Dark blue jelly with medium-sized blue and green glitter. There’s also some tiny glitter in there to add to the overall shine. This one reminds me of fireworks! Two coats, and I did some dabbing for even glitter on my tiny pinky. Bonus: Rimmel’s Metal Rush “Pearly Queen”. A sheer lavender with light green shimmer. Such a pretty, subtle color in person. I used four coats here. What do you think? What will you be wearing for New Year’s Eve?